Software By Winshots Technologies :: we are proud to present some of software products which are designed to make your life and computer experience much easier. There are a lot of products out there, doing the same thing. So what’s so different about our software? We believe that all software should be easy to use, as small as possible with minimal footprint, and it should concentrate on what it is supposed to do. A lot of programs out there are trying to do pretty much everything. For example, did you know that only about 10% of all word processor features are being used by most people? So what about the remaining 90%? Well, all other features drag along, forcing you to constantly upgrade your hardware and your operating system. In our opinion they’re nothing more than unnecessary bloat on your computer. Our #1 promise is: no bloat! Our programmers develop applications which “talk” directly to the operating system and often come in a single file. This means you do not need to worry about an installation program dropping files all over the place, modifying your system setting and registry. Did you ever notice how after a while your computer starts running slower and slower then the day you first bought it? That’s because of the “bloat” we’re talking about. Before you decide to download any software, do your homework, and make sure you’re getting a right tool for the job and not the “MacGyver” of them all. A Windows application designed to track changes on your system made by installing or running 3rd party applications. This is a perfect tool for track system changes when you’re unsure of what is being dumped on your PC by 3rd party installers or what changes are being made by running programs. 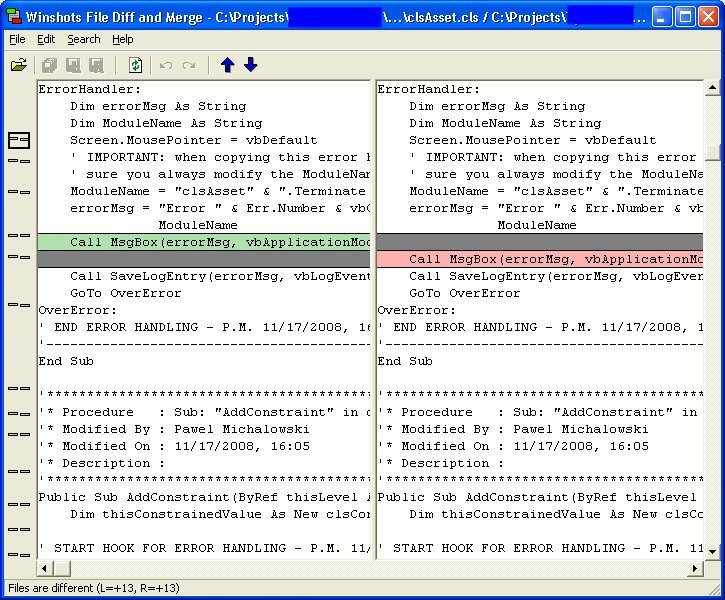 This very simple utility allows you to compare files and merge them visually with one click. Latest update (build 2.2009.11.10; beta) includes folder comparison and some other improvements to the existing code. Are you new to screen capture? Winshots ScreenGrab allows you to capture anything you see on your computer screen. Whenever you’re writing a report or that presentation ScreenGrab will quickly capture and save your captures in popular file formats. What’s best is ScreenGrab is completely FREE. No nag screens, no registration screens, no evaluation countdown, no spyware, no mandatory toolbars to install, no nonsense! NOTHING but a small Windows application designed to do just one thing: capture anything you see on your computer, PERIOD! 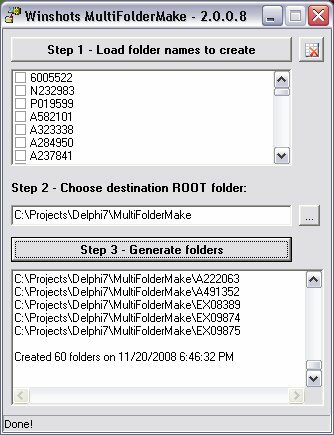 This very simple utility allows you to create multiple folders with one click. This very simple utility allows you to monitor 3 things: Windows Service (if it is running), URL accessibility (via HTTP GET), and IP address accessibility via *ping*. A simple system tray notification area alerts you if any one of the services is down or inaccessible. Fully tested on and supports Windows Vista/7 and 2008 Server 64-bit! (make sure you “Run it as Administrator”) This tool is free, “AS-IS” demonstration of our commecrial product. In a full version you can monitor multiple Services, URLs and IPs as well as additional services such as FTP, SMTP, UDP, and much more. Comercial version also provides notification alerts via e-mail or text messages. Contact Winshots today to find out more!